The story of the student lead revolution that started in Kyiv's Maidan Square which happened when the Ukrainian President refused to sign into law sweeping legislation to end corruption and make things fairer and more independent. He claimed he couldn't do it because of Russian pressure. 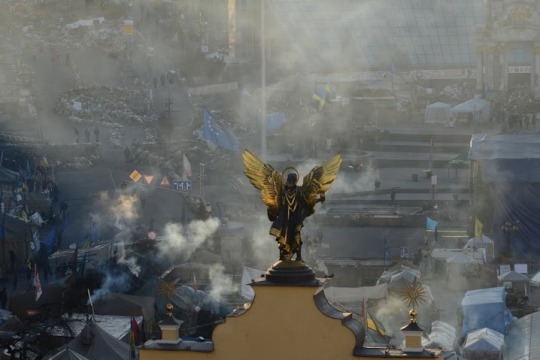 When the students that had gathered in Maidan Square were attacked by riot police for no reason the populace reacted with an even larger protest of 800,000 people. This then set events in motion that were hoped would lead to lasting change and true democracy. Another in a long line of films documenting the ever changing in Ukraine, this film scores over several others thanks to its fly on the wall nature. While the subject matter isn't anything new if you've been following events in Ukraine or have been watching the films that have been coming out, its the footage and narration/interviews where the film scores. The film is very much there in the minute with some startling film footage of events as they transpire. Additionally the film has lots of interviews, surprisingly in English, with a good number of the people who were there. While I didn't really feel I was seeing anything new regarding the revolution thanks to reading the internet and seeing any number of recent documentaries, I did feel I understood thing better thanks to the clear narration and you are there footage. Some of the footage is so cool I wish I had seen this on a truly HUGE screen so I could have fallen into it. Ultimately this is a solid documentary all around. If you know about the events you'll see them on a much more personal level, while if you're seeing a film on Ukraine and it's troubles for the first time you're going to get one hell of a nice primer.